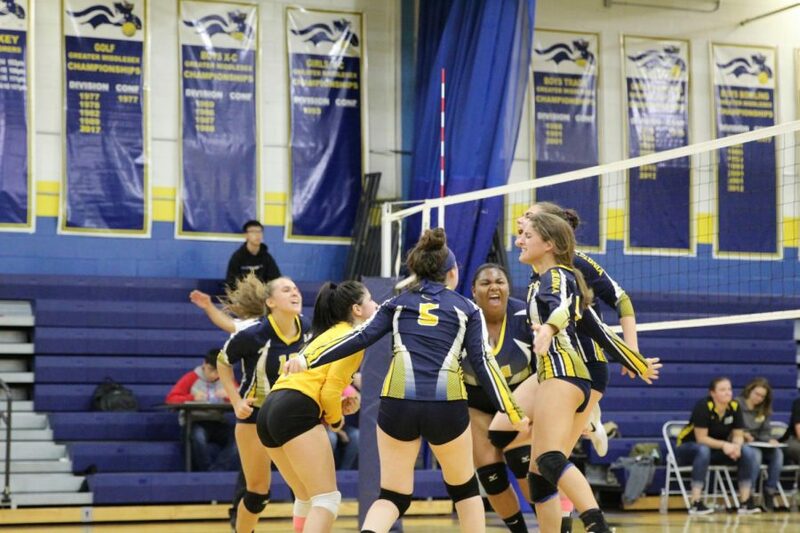 On October 15, 2018 the Colonia High School Girls’ Varsity Volleyball team beat J.P Stevens with a score of 2-0. 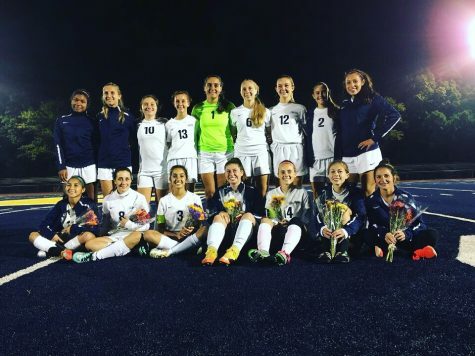 With the impressive win against J.P Stevens, the girls also celebrated their seniors. 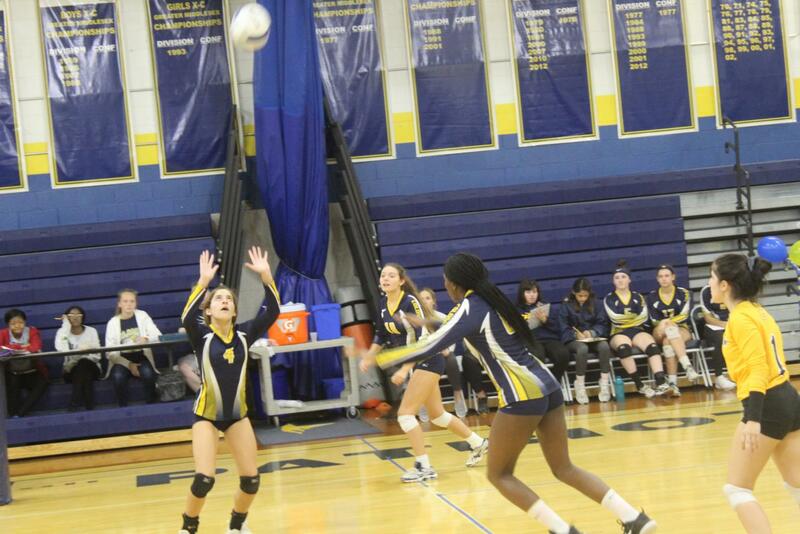 Junior Giana Moreira (4) setting the ball for junior Patience Heath (14) getting ready to spike over the net. 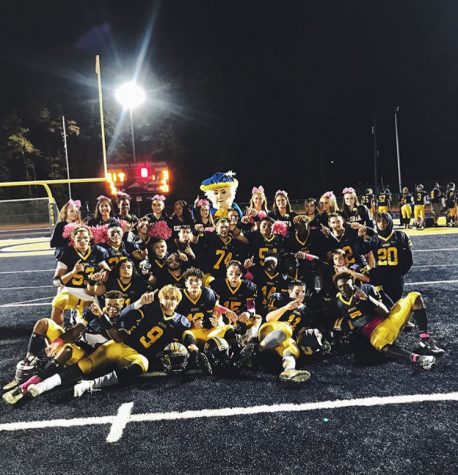 Prior to this game, Colonia and J.P Stevens played each other on October 4, 2018 at J.P. Stevens. 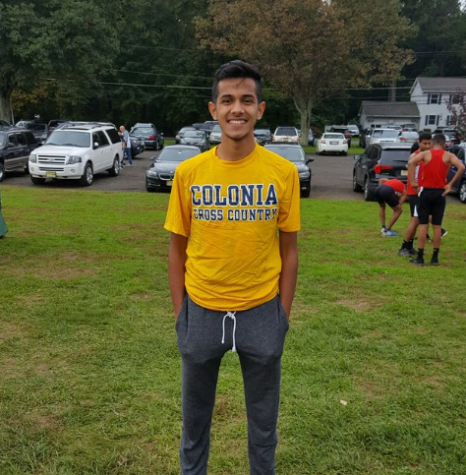 Colonia also took home the victory with a score of 2-1. 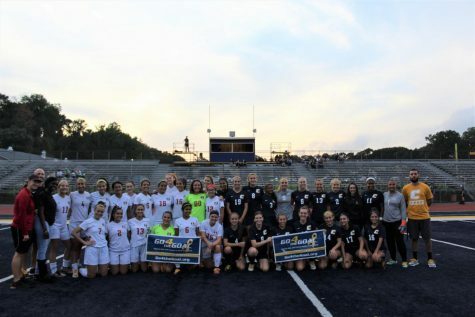 The two teams faced off again, this time in the Colonia High School gym. Colonia won the first set with a score of 27-25. 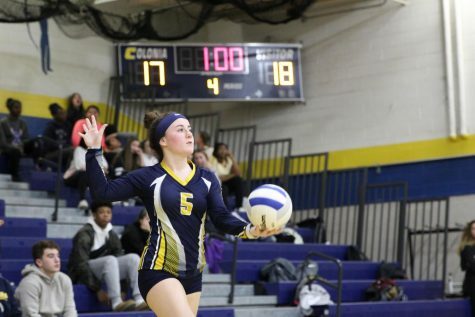 In the first set, Junior Gianna Moreira (4), setter, set the ball for Junior Patience Heath (14), middle blocker, who then successfully hit a kill over the net helping Colonia. Heath had 11 kills in the game in total. While Moreira had 25 assists in the game in total. J.P Stevens was loosing the majority of the set. However, J.P Stevens made a major comeback making the score 25-25. 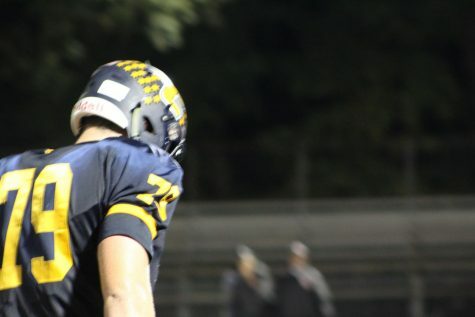 Colonia hit some of the balls out of bounds, making it J.P Stevens comeback possible. Everyone in the stands, were on the edge of their seats. In the end, Colonia won the set with a score of 27-25. The Freshman and JV girls volleyball team came to support the Varsity girls. The stands were packed by fellow students and parents. With every exciting point the crowd cheer the girls on. In the second set, Colonia won 25-10. 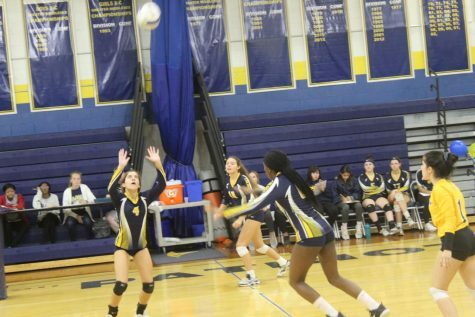 Sophomore Sofia Wintonick (1) , Colonia’s libero, dove to the ground to save the ball making it Colonia point. In addition, Wintonick had the most digs between the two teams with a total of 20 digs. Next, Junior Tiffany Rolan-Locus (14), a outside hitter, jumped up and blocked the ball from J.P Stevens making it Colonia’s point. That was Rolan- Locus only block in the game. Lastly, Junior Johanna Kovalewich (13), a middle blocker, had a kill making it Colonia point. Kovalwich had two kills in total during the game. J.P Stevens gave up a few points by hitting the ball out of bounce. 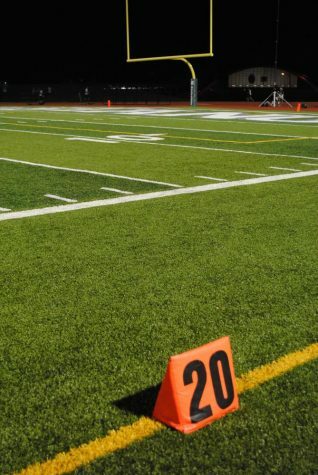 Even though J.P Stevens had many good plays, they couldn’t catch up to Colonia. With the successful win it was an emotional night for the four graduating seniors. 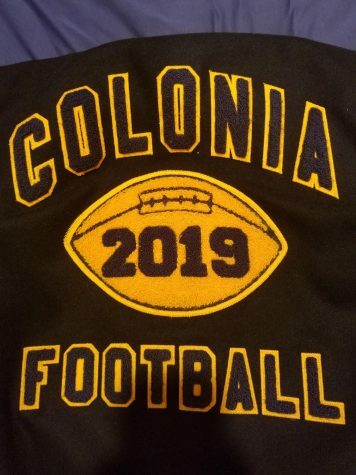 The seniors on the Colonia Varsity team include Camila Camacho- Teneiro (9) , Dakota Dacunha (10), Kelli Mulrooney (5), and Jordyn Pagnozzi (17). Before the game started head coach, Coach Hennessy, announced the senior’s and gave them each flowers. The gym was decorated with balloons, streamers, and poster’s made by fellow teammates. 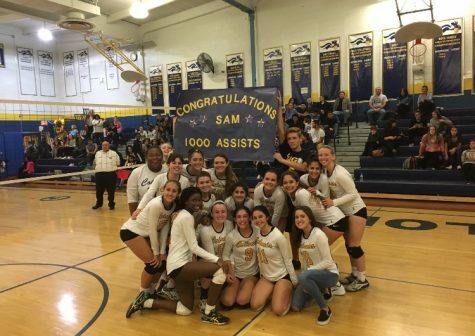 Camacho-Teneiro tore her ACL in her left knee during a volleyball game against Old Tappan and is out for the rest of the season. However, Camacho- Teneiro had a very impressive high school volleyball career being an outside hitter. Camacho- Teneiro had 337 kills and 439 digs throughout her high school career on varsity. Throughout Dacunha’s high school career she had a total of 45 kills and 12 digs so far. Dacunha is right side hitter for the team. 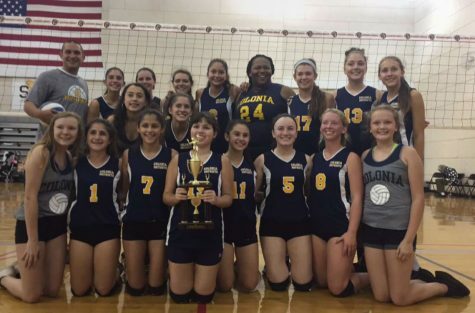 The Colonia Girls’ produced 12-0 in-conference season. Their overall record is 17-3 as they head into the GMC’s and state competition.